TUNE MUSICAL INSTRUMENTS QUICKLY AND PRECISELY! Are you looking for an easy way to tune multiple string instruments? 11 Tuners App helps you to tune the following musical instruments: guitar, bass guitar (4 and 5 strings), violin, mandolin, viola, ukulele, cello, banjo, double bass, dombra and balalaika. With our precise chromatic tuner app, you can tune those instruments quickly and accurately! For all instruments that this app supports, there is a sound generator with the authentic sound for each string of the musical instrument! Tune your music instruments with this precise tuner app! The big collection of 11 tuners are quick and easy! You can listen to the sound of each string. Furthermore, you can check whether the string is tuned correctly and adjust the sound of the string with the help of our chromatic tuner. 11 Tuners App also supports Audio input and microphone of your PC, Mac or mobile device. Please check that the microphone is turned on. Also choose your preferred tone. For each Instrument there are 11 tonalities in the settings. The buttons on the bottom of the App window to play the correct sound for each String of the selected instrument. There is also a repeat key, which repeats the sound, so you can focus on the strings of your instrument. 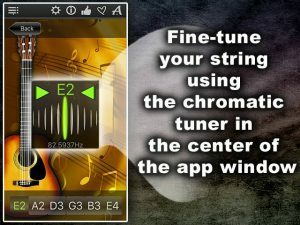 To fine tune each String, use the chromatic Tuner located in the middle of the App window. If the Tuner flashes green while playing the String, the String is perfectly tuned. If it flashes red, the String must be tuned further. The chromatic Tuner even gives you an indication of whether the tone of the String should be adjusted upwards or downwards. For example, if the left arrow flashes red, the String sounds too deep and needs to be tuned higher. If the right arrow flashes red, it means that the String sounds too high and needs to be tuned deeper. So work on the strings of your musical instrument until the chromatic Tuner flashes green. Did you tune all the strings? Now you can enjoy the perfect sound of your instrument!